My daughter has Type 1 diabetes and uses an insulin pump. We love the pump, but it can be a challenge to wear or carry it 24/7 especially for an active 7 year old. Do you see the white marks on there? I think those came from the monkey bars at school. At first, I made her lots of belts/pouches to wear around her waist. They worked great when she was 5 years old, but now she refuses to wear them. So, now I add "secret" pockets to all of her clothes. I thought I'd share how I add them for various types of clothing. I've occasionally found a prize rock in there, too. A word about the "secret" part. My daughter is 7 years old. While she is fairly open about her condition, she does get tired of answering questions - especially when she's not sure how to answer them. When kids see her pump or tubing, they naturally ask lots of questions, so keeping it hidden is nice for her. As for my husband and I, we like it because her pump is better protected while she plays. In this tutorial, I will be adding a pocket to leggings that I made using the Oliver + S Playtime pattern. So, the pocket fabric matches the leggings. However, you can add this pocket to any made bike shorts or leggings. 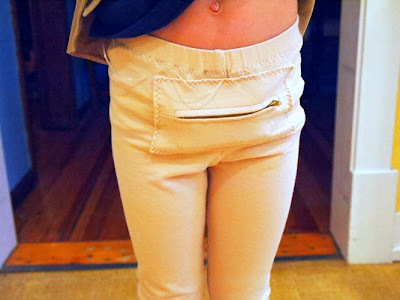 The pocket doesn't have to match. You can even have fun using contrasting or pattern fabric for the pocket. I'm still only dreaming of my coverstitch machine, so I use a 3 step zig-zag to topstitch knits. It is quick and easy. If you prefer a cleaner look, you can use a double needle instead. You'll need the two pattern pieces below. Just click on the image below to go to the full size file. Be sure to print the PDF without scaling. 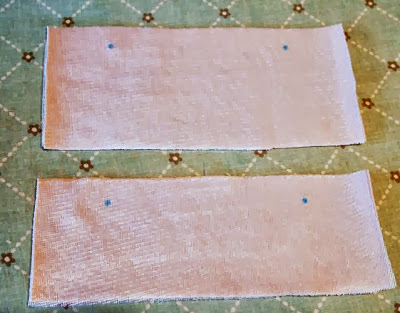 Step 1: Cut one of each pattern piece from knit fabric and tricot interfacing. Tricot interfacing is stretchy across the grain. 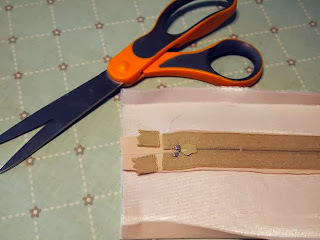 Make sure that you cut both materials with the greatest stretch in the direction of the long edges as shown on the pattern pieces. I just stack the materials and cut them both at once. 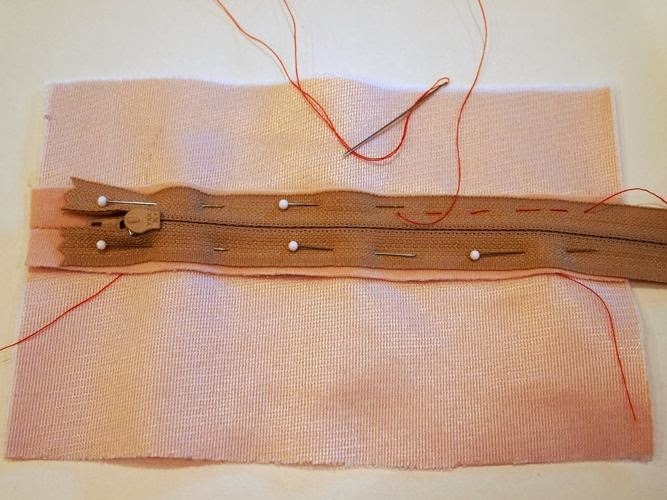 Step 2: Transfer the dots from the pattern pieces to the fabric. You'll need to be able to see it on the wrong side. 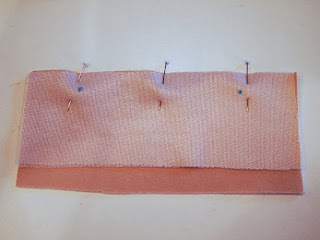 Step 3: Following the manufacturer's instructions, fuse the interfacing to the wrong side of each piece. Step 4: Pin the top and bottom right sides together matching the dots. Stitch from the each edge to the dot. 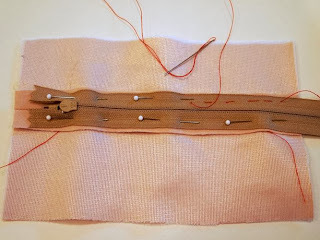 Backstitch at each dot to secure the stitching. Step 5: Machine baste between the dots. 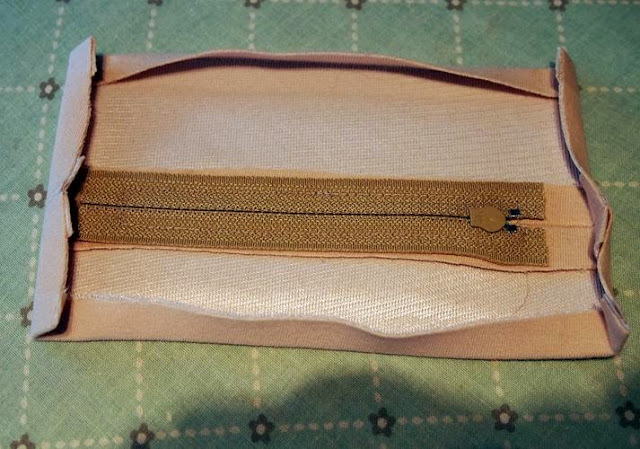 This is where the zipper will go. I recommend switching to a contrasting thread color for the basting. 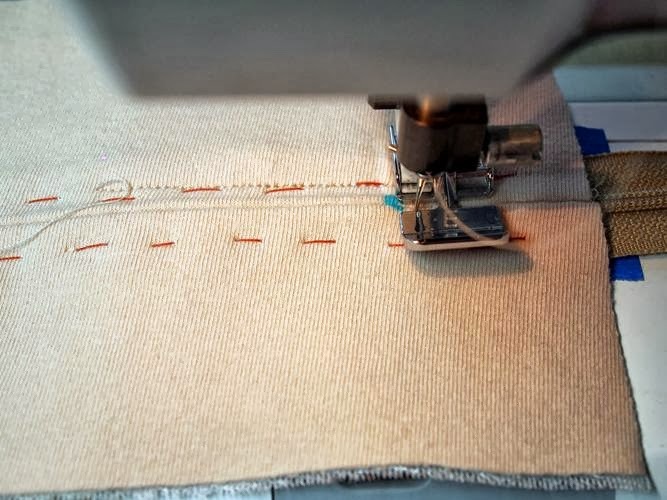 This makes it easier to see the basting stitches when it is time to remove them. 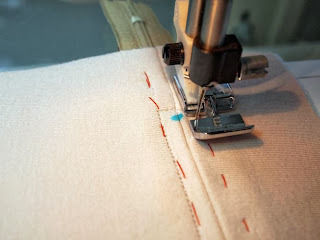 Step 6: Press the seam allowances open. 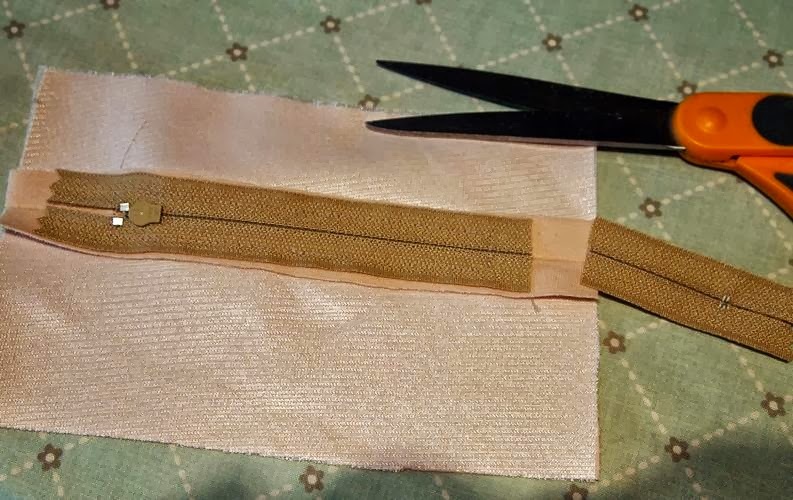 Step 7: Now it's time to add the zipper. Don't worry - it isn't really that difficult! 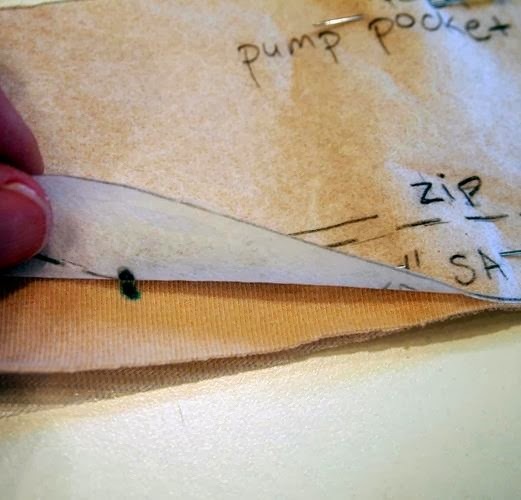 Lay the zipper over the seam allowances with the right side of the zipper down. Make sure that the zipper pull is at the dot. 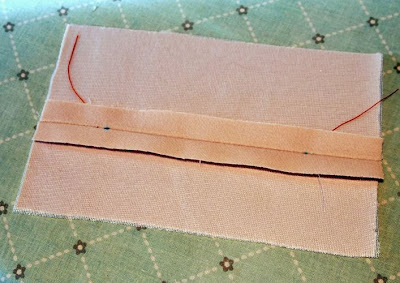 If you are using a zipper longer than 4", the closed end will extend past the other dot, and possibly past the edge of the pocket. That is OK - you'll trim it later. Step 8: Pin the zipper in place through all layers. IMPORTANT: Be sure that the zipper pull is flipped toward the top of the open end of the zipper as shown. 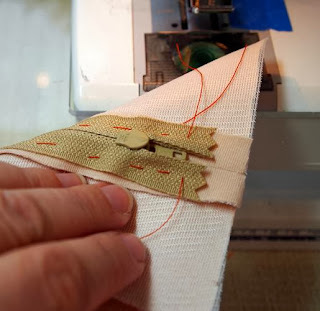 This will allow you to move the zipper slide during stitching. 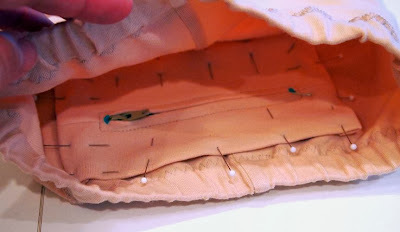 Step 9: Hand baste the zipper to the pocket, again going through all layers. 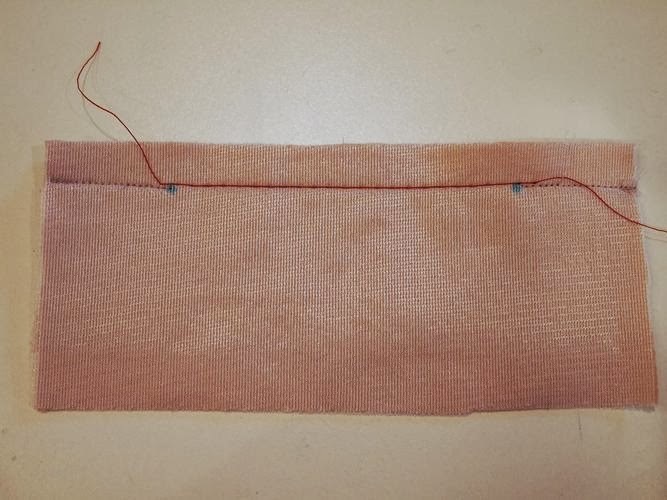 You'll just be doing a basic running stitch here. Don't skip this step - it only takes a couple minutes and makes stitching the zipper easy. 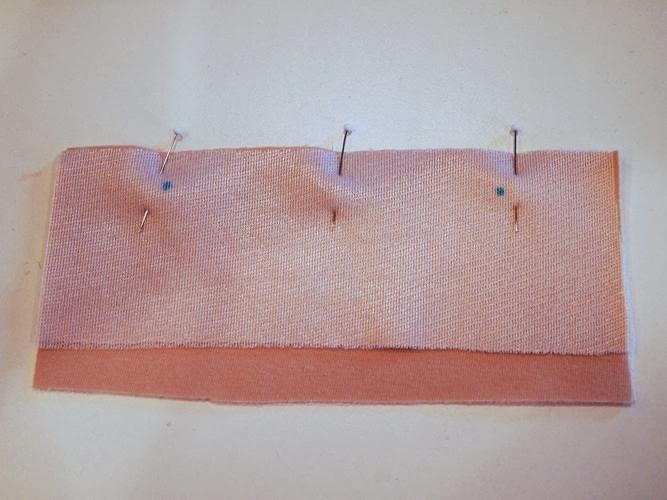 Remove the pins as you go along. 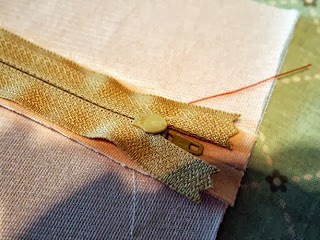 I also use contrasting thread for this basting. Here it is all basted, looking at the right side. 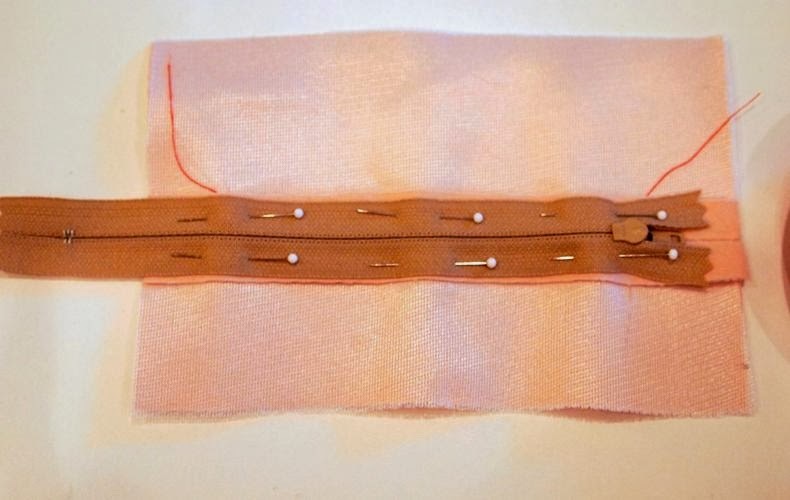 Step 10: Stitch the zipper to the pocket as follows. Using a zipper foot and beginning at the middle of the zipper, stitch along the zipper approximately 1/4" from the zipper. Be sure you are stitching toward the closed end. 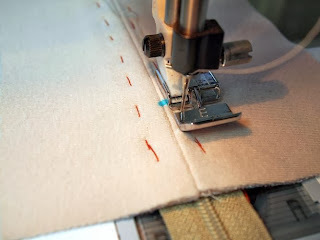 Stop when you are just to about 1/4" past the dot at the end of the zipper opening. 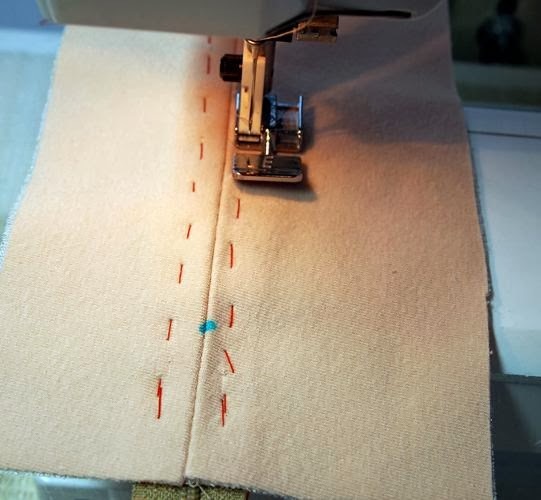 I'm putting the pocket on my machine with the zipper pull end leading (away from me). 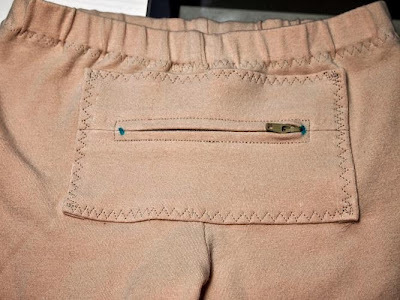 Notice that the zipper is fully closed. I start sewing at the center of the zipper and stitch toward the bottom/closed end of the zipper. 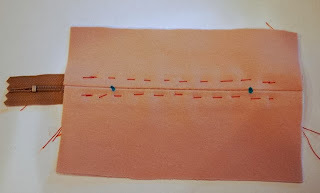 Stop when you've stitched just past (~1/8") the dot. 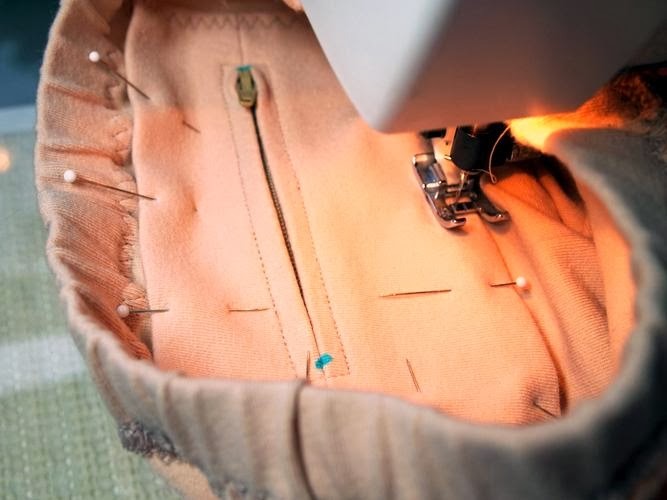 IMPORTANT: When you stitch across the zipper, be sure that you do not stitch over the metal stops of the zipper. Just use your fingers to feel where they are and verify that you won't hit them. Now you'll pivot and stitch across the zipper. 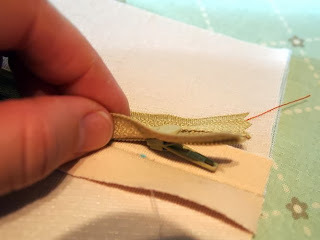 With the needle down, raise the presser foot and pivot the fabric. Pivot again and begin stitching along the other side of the zipper. 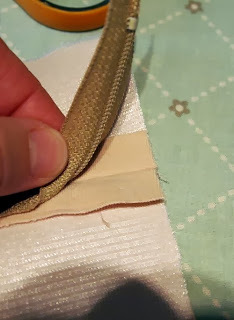 Stop when you reach the middle of the zipper. 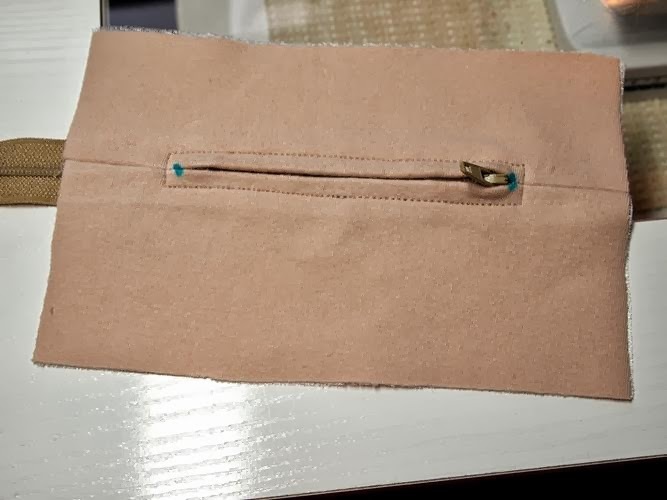 Now you need to move the zipper pull to get it out of the way for stitching the other end. With the needle down, lift the presser foot and reach under the pocket to slide the zipper pull past the needle. I couldn't take a picture of this - not enough hands! 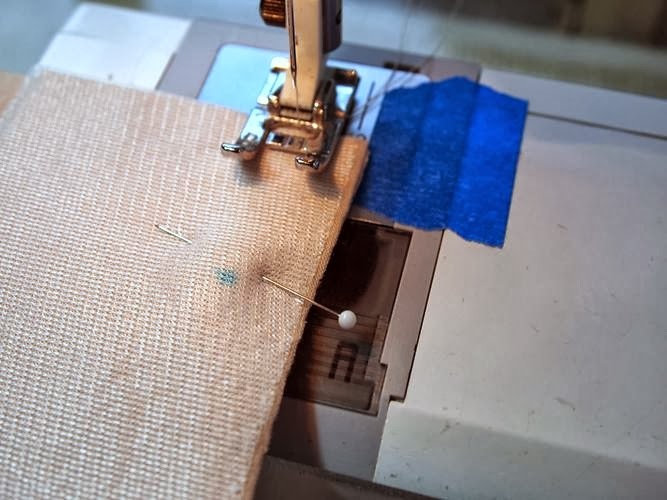 Continue sewing to just past the next dot, pivot and sew across the zipper, pivot again and sew back to where you started. Backstitch to secure the stitching. YAY! The zipper is in! Step 11: Remove all of the basting stitches and pop the zipper pull up through the zipped opening. If you are using a zipper longer than 4" as I did here, you'll have a loose tail hanging over the edge of the pocket. 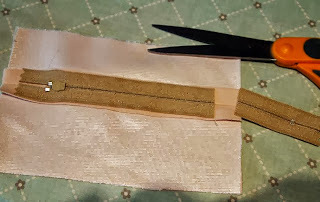 Simply trim off that tail about 1/4" past the end of the stitching. Trim the other end about 1/4" from the metal stops. 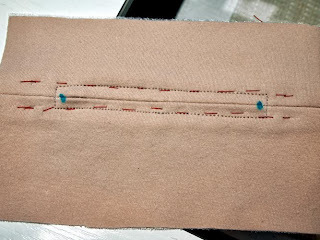 Step 13: Turn under all four pocket edges by 1/2" and press well. 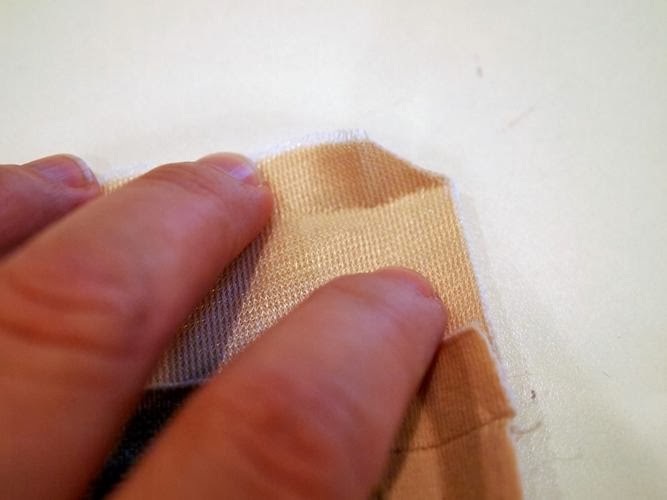 Step 14: Fold out the corners and trim them to reduce bulk. 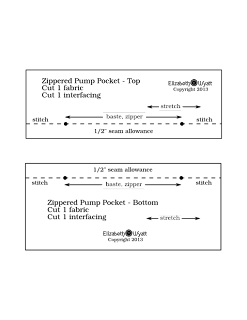 Use the fold lines to see where you should trim as shown below. Step 15: Fold the edges back under and center the pocket on the front of the leggings. 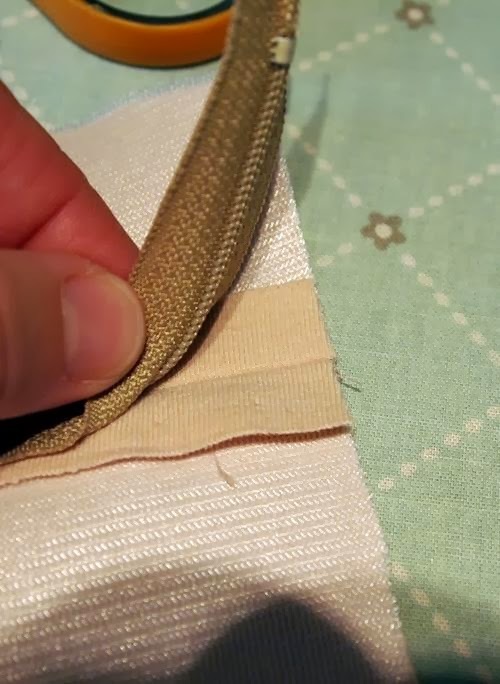 You'll want the top edge close the bottom of the elastic casing, so that it isn't riding too far down. 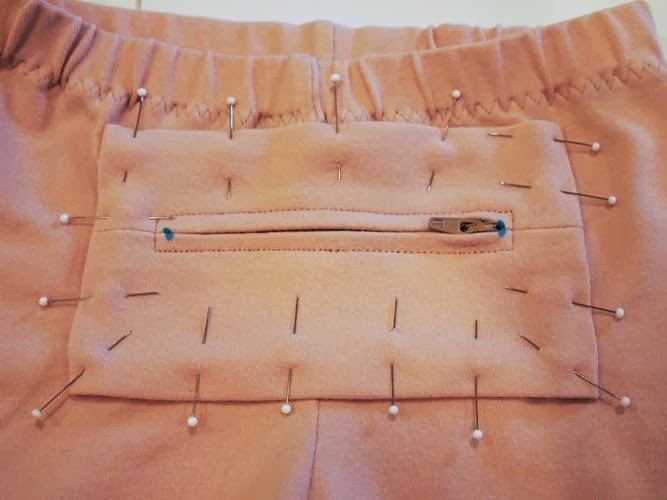 Pin in place, being sure to only pin through the front layer of the leggings. Step 16: To make it easier to sew the pocket on, turn the leggings inside out. 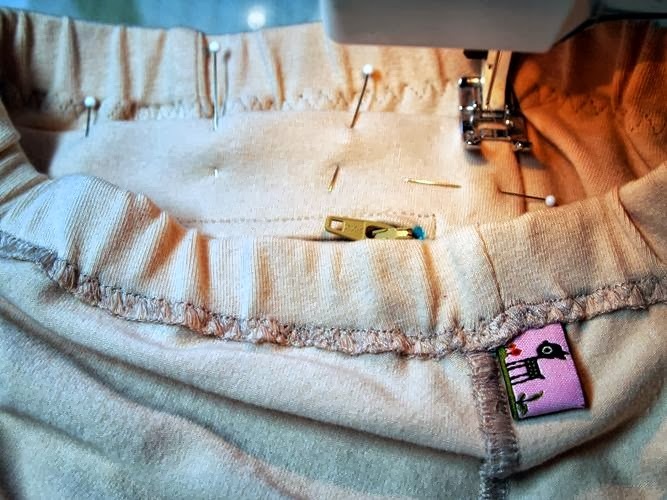 You'll be sewing inside the leggings with the wrong side against the machine bed. Step 17: Topstitch around all four sides of the pocket using a stretch stitch. I like to use a 3-step zig-zag. Step 18: Turn right side out and you are DONE!! Look mom - no pump! 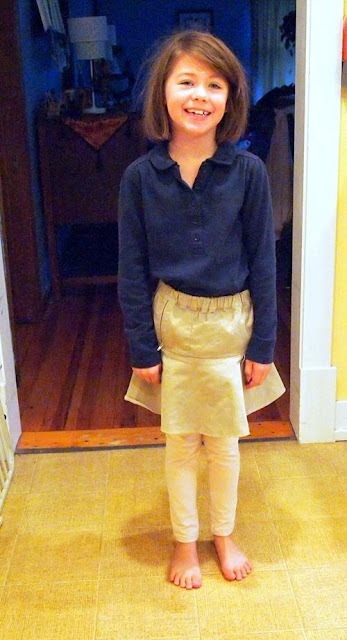 All ready for school in her cozy, warm leggings. Pssst - see that other zipped pocket on her skirt? 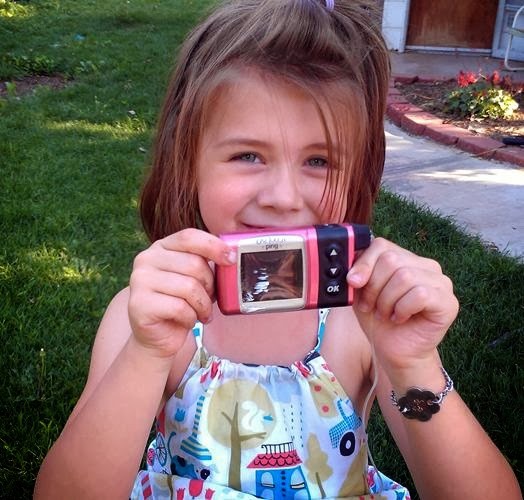 That's where she carries her CGM (continuous glucose monitor). I'll show you how I added that another day.